Did flip-flops purchased at Wal-Mart cause skin rashes or chemical burns? after some purchasers reported suffering skin rashes or chemical burns. 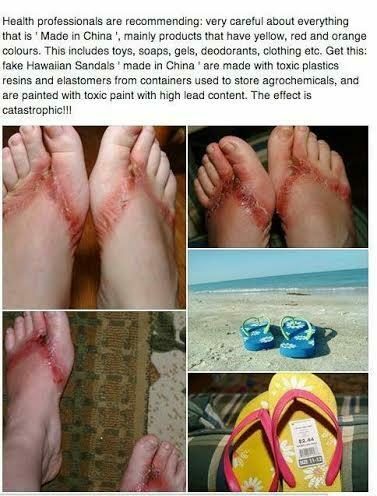 Get this: fake Hawaiian Sandals ‘made in Chine’ are made with toxic plastics resins and elastomers from containers used to store agrochemicals, and are painted with toxic paint with high lead content. The effect is catastrophic! Don’t buy flip flops from Wal-mart! at Wal-Mart. Soon after wearing the sandals (which she donned only a few times), she developed a painful skin rash or chemical burn on her feet that corresponded with the thong portion of her flip-flops. The flip-flops had been manufactured in China. Others who had bought the same brand of sandals reported experiencing similar problems. In September 2007, Wal-Mart instructed its stores to stop selling the product until it could conduct its own investigation. footwear, the unfortunate woman (and others) could also have experienced an allergic reaction to some otherwise innocuous substance used in the manufacturing process. Stiles challenged Wal-Mart’s claim of receiving only ten complaints about the brand of flip-flops that injured her, providing accounts (including photographs) on her web site of others similarly harmed. The Early Show [CBS]. 12 September 2007.